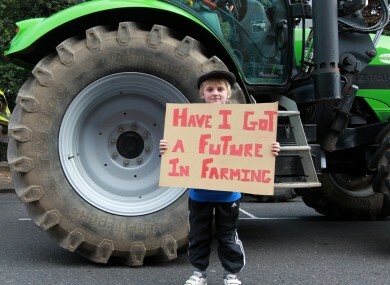 7-year-old Ciaran Tiernan from Co Louth at today's protest. THE MINISTER FOR Agriculture has said that he understands why farmers from across the country have decided to protest against cuts to the Common Agricultural Policy (CAP). I can understand why the farmers are here today. There are major decisions being debated and made about the future of farming across Europe for the next seven years. His response came following concerns from the Irish Farmers Association (IFA) about cuts to the CAP which, they believe, could have a direct impact on both Ireland’s agricultural exports, which total €9 billion, and the 300,000 people that are currently employed in the sector. “We are at a crucial point now in the review of the common agricultural policy, which delivers the €1.6 billion each year into Ireland currently, and into agriculture in Ireland,” he said. It’s my job to get the best possible deal for farmers for the next seven years to ensure the new CAP reform, which Ireland will be central to because we’ll hold the chair of the Council of Ministers during the Irish presidency when the CAP deal gets finalised in the first six months of next year, and that we get a deal that makes sense for Europe but also makes sense for Ireland in terms of our ambition for growth and expansion. When contacted by TheJournal.ie, Garda sources were unable to provide an estimate of the numbers that are currently protesting, but it is believed to be in the region of 10,000 people. Email “Minister: I understand why farmers are protesting today”. Feedback on “Minister: I understand why farmers are protesting today”.